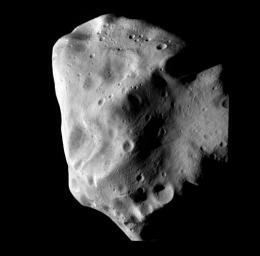 An image released by the ESA shows the Lutetia asteroid at closest approach from the Rosetta spacecraft. The European spacecraft Rosetta performed a fly-by of a massive asteroid on Saturday, the European Space Agency said, taking images that could one day help Earth defend itself from destruction. The European spacecraft Rosetta performed a fly-by of a massive asteroid, the European Space Agency said, taking images that could one day help Earth defend itself from destruction. Racing through the asteroid belt between Mars and Jupiter at 47,800 kph (29,925 mph), the billion-euro (1.25-billion-dollar) probe flew Saturday within 3,200 kms (2,000 miles) of the huge potato-shaped rock, Lutetia. "The fly-by has been a spectacular success with Rosetta performing fautlessly," ESA said in a statement. "Just 24 hours ago, Lutetia was a distant stranger. Now, thanks to Rosetta, it has become a close friend," the agency added. Holger Sierks of Germany's Max Planck Institute, who is in charge of the spacecraft's Osiris (Optical, Spectroscopic and Infrared Remote Imaging System) camera said the more than 400 "phantastic images" showed many craters and details.